As writers I think it's important to be in touch with our emotions. I want you to take a moment and really think about how you feel when you write. Most of the time it should be a good feeling. Now, I know that sometimes those feelings get stuck. I most often turn to music for my inspiration (as you know if you've follow me for a while) but sometimes images do the work just as well. Here are a few pictures that I think tell a story for themselves. In this one I can just imagine something terrible is about to come out and get her. Just think of the journey this bear must have taken to get to this place, all alone. Could this be the start of some great concert pianist? Flirting - with books. That's the best kind. And this one is representative of my life. 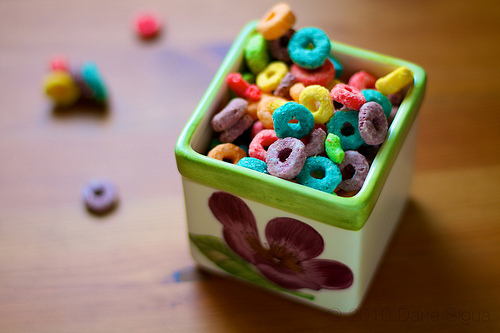 I found all of these images on We Heart it. What has inspired you today? Good friends have been inspiring me today. And that first picture reminds me of an adventure under the sea, nothing scary. I guess that's the water baby in me! These are all beautiful images. And what's great is how everyone responds differently. FOr the first one, you saw danger, I saw soul searching! Going to check out We Heart it. I second Susanna, great posts. My mood while I'm writing tends to be TIRED. Is that an emotion? 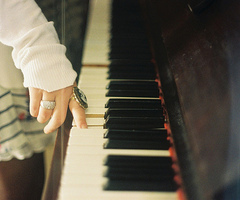 So music helps, and pictures too. I'll have to check out this site because those pictures were the bee's knees. @Nisa - I love the water too, and I certainly think that picture holds more than one story. @Kelly - "The bees knees" see, that right there, is why I love you. It's interesting that you thought something terrible was going to happen to the girl walking on the floor of the beautiful sandy ocean barefoot. I had a different thought. I thought, "wow...how wonderfull it must feel to have the clean sand run between your toes...that obviously tropical water wash over the skin..."
That first picture is so soothing. Being somewhere warm (I hope because the water is so clear) sounds heavenly right now. 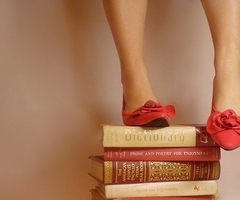 I feel bad the first thing I looked at for the flirting with books pictures were the shoes. They're really cute shoes. I think I must be almost 100% visual. Sound doesn't do that much for me, so I often look to artwork and photos for inspiration. I get a lot of post ideas from surfing through photos online. These are great. For some reason, when I look at that picture of the teddy bear, I think more along the lines of a "Chucky" moment than wonder about the journey, lol. And that's weird since I used to collect teddy bears! Those are great photos! The first picture reminds me of something from a fantasy story. 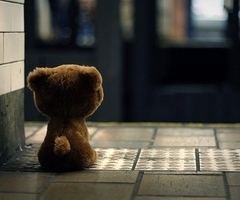 The teddy bear pic reminds me of Close Encounters, like it was left behind when the aliens took that adorable little boy. My favorite photo in this post is the Flirting - with books. What a cool photo! This would make a great writing prompt! I love music, too. I need to put some on - right now! It is so wonderful how we all see our own thing in the images! Walking under water feels peaceful to me, while the bear breaks my heart as I imagine a child who left it behind. It feels like the life lesson I've been learning lately - The that each person sees things their own way, we can't change that so we just need to be who we are, not what we think the other person wants us to be. Awwww. I felt sort of sad for the little bear for some reason. I wanted him to have a friend sitting beside him, or looking back at him. Love this post though and the idea of letting pictures inspire us! Today, I was inspired by our sudden weather change here in Maryland - the transition from summer to fall, open windows and cool morning breezes and putting on my favorite comfy fleece and smelling campfires - all those things get the writing mojo zinging again : )!